GCHQ continue to see real threats to the UK on a daily basis, and the scale and rate of these attacks shows no sign of abating and is expected to increase rapidly. The BIS 2014 Information Security Breaches Survey reported that 81% of large organisations had experienced a security breach of some sort. This costs each organisation, on average, between £600,000 and £1.5 million. This guidance is for businesses looking to protect themselves in cyberspace. 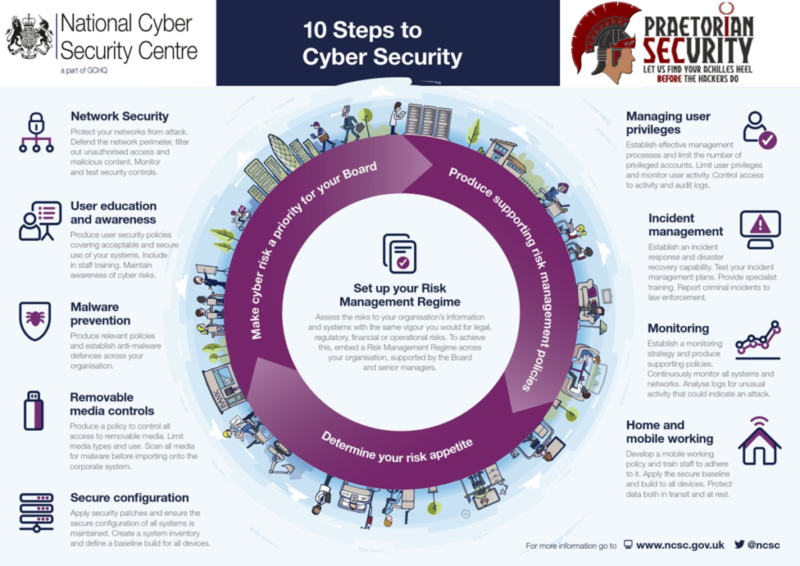 The 10 Cyber Security Steps – originally published in 2012 and now used by around two thirds of the FTSE350 – remain the same and are outlined below. But alongside this second version of the 10 Steps we are also publishing a new paper, “Common Cyber Attacks: Reducing The Impact”. The paper sets out what a common cyber attack looks like and how attackers typically execute them. We believe understanding the cyber environment and adopting the 10 Steps are effective means in protecting your organisation from these attacks. Defining and communicating your Company Information Risk Management Regime (shown at the centre of the following diagram) is central to your organisation’s overall cyber strategy. This regime and the steps that surround it are described below. Assess the risks to your organisation’s information assets with the same vigour as you would for legal, regulatory, financial or operational risk. To achieve this, embed an Information Risk Management Regime across your organisation, supported by the Board, senior managers and an empowered information assurance (IA) structure. Consider communicating your risk management policy across your organisation to ensure that employees, contractors and suppliers are aware of your organisation’s risk management boundaries. Introduce policies and processes to develop secure baseline builds, and manage the configuration and use of your IT systems. Remove or disable unnecessary functionality from IT systems, and keep them patched against known vulnerabilities. Failing to do this will expose your business to threats and vulnerabilities, and increase risk to the confidentiality, integrity and availability of systems and information. Connecting to untrusted networks (such as the Internet) can expose your organisation to cyber attacks. Follow recognised network design principles when configuring perimeter and internal network segments, and ensure all network devices are configured to the secure baseline build. Filter all traffic at the network perimeter so that only traffic required to support your business is allowed, and monitor traffic for unusual or malicious incoming and outgoing activity that could indicate an attack (or attempted attack). All users of your IT systems should only be provided with the user privileges that they need to do their job. Control the number of privileged accounts for roles such as system or database administrators, and ensure this type of account is not used for high risk or day-to-day user activities. Monitor user activity, particularly all access to sensitive information and privileged account actions (such as creating new user accounts, changes to user passwords and deletion of accounts and audit logs). Produce user security policies that describe acceptable and secure use of your organisation’s IT systems. These should be formally acknowledged in employment terms and conditions. All users should receive regular training on the cyber risks they face as employees and individuals. Security related roles (such as system administrators, incident management team members and forensic investigators) will require specialist training. Establish an incident response and disaster recovery capability that addresses the full range of incidents that can occur. All incident management plans (including disaster recovery and business continuity) should be regularly tested. Your incident response team may need specialist training across a range of technical and non-technical areas. Report online crimes to the relevant law enforcement agency to help the UK build a clear view of the national threat and deliver an appropriate response. Produce policies that directly address the business processes (such as email, web browsing, removable media and personally owned devices) that are vulnerable to malware. Scan for malware across your organisation and protect all host and client machines with antivirus solutions that will actively scan for malware. All information supplied to or from your organisation should be scanned for malicious content. Establish a monitoring strategy and develop supporting policies, taking into account previous security incidents and attacks, and your organisation’s incident management policies. Continuously monitor inbound and outbound network traffic to identify unusual activity or trends that could indicate attacks and the compromise of data. Monitor all ICT systems using Network and Host Intrusion Detection Systems (NIDS/HIDS) and Prevention Systems (NIPS/HIDS). Produce removable media policies that control the use of removable media for the import and export of information. Where the use of removable media is unavoidable, limit the types of media that can be used together with the users, systems, and types of information that can be transferred. Scan all media for malware using a standalone media scanner before any data is imported into your organisation’s system. Assess the risks to all types of mobile working (including remote working where the device connects to the corporate network infrastructure) and develop appropriate security policies. Train mobile users on the secure use of their mobile devices for locations they will be working from. Apply the secure baseline build to all types of mobile device used. Protect data-at-rest using encryption (if the device supports it) and protect data-in-transit using an appropriately configured Virtual Private Network (VPN). For information on Cyber Essentials or any of our other offerings please contact us. Please feel free to ask any questions or contact us.